They’re calling it the resurrection of Mickey Rourke and they may just be right. A Golden Globe win and an Oscar nomination is one hell of a comeback considering how longs he’s been out of the game, choosing to spend his days honing his skills for the ring rather than the stage. In The Wrestler Rourke brings us a character who looks every bit the coarse, broken man that’s playing him; underneath the tight neon pants and scraggly bleached-blonde hair it’s still Mickey Rourke. Going into The Wrestler I expected the type of performance from Rourke where he’d literally reach out of the screen and rip your eyes out- acting that was big and showy, like wrestlers in real life. But I was pleasantly surprised to find his emotionally intense performance to be not the testosterone-fuelled brawl -fest some may have expected, but something a lot smarter. I don’t want to put too much emphasis on the word ‘restrained’ but it was this aspect of his acting that made this character believable and open to sympathy. He shows that you can still give a knockout performance in this sort of movie without hamming it up. We enter the movie at the latter stages of Randy “The Ram” Robinson’s career where he’s still living in the afterglow of his past glories. Once a top wrestler, he’s now well past his prime and languishing in small-time matches just to pay the bills. He’s not so much living as existing day-to-day. His relationship with his daughter (Evan Rachel Wood) is barley existent while he spends his nights frequenting the bar where stripper Cassidy (Marisa Tomei) works attempting to get close to her. 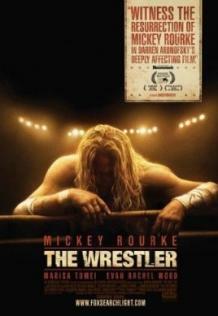 The Wrestler truly is the Mickey Rourke show, with only a handful of scenes throughout the movie not featuring him. The other characters are basically moons circulating this planet of a man. There is something about his character that’s likable, in spite of his profession, his stupidity and his embarrassingly regular trips to the strip joint. Rourke pulls it off brilliantly. More dramatic than I would have guessed, The Wrestler is a compelling piece of cinema that showcases the talent of a man who could so easily have never turned up on screen ever again, let alone in an Oscar-nominated role.